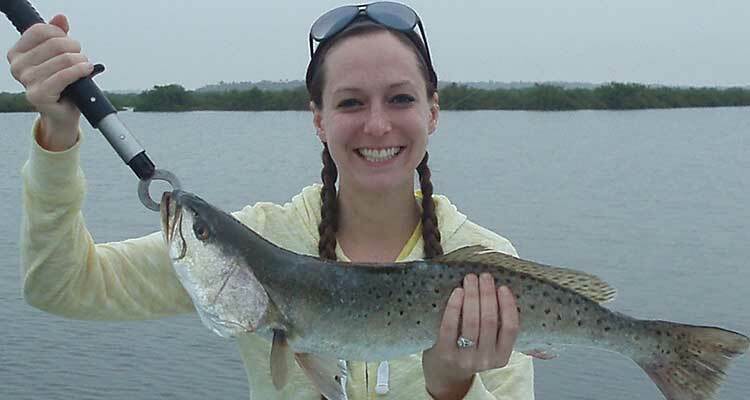 Mosquito Lagoon is one of the most prolific and well-known habitats of the Spotted Seatrout. Also referred to as Speckled Trout, this estuary fish is actually a member of the drum family. Spotted Seatrout are found in brackish, inshore to marine waters but are mostly caught in shallow, grassy flats areas and near oysters bars. Mostly bottom dwellers, they tolerate a wide range of salinity- up to 75 parts per thousand. Found from Cape Cod to Florida, Spotted Trout are known to remain near the area they were spawned. Speckled Seatrout have large, canine-like teeth with a huge lower jaw containing a row of tight set teeth. They have shiny, silvery sides with black peppered spots of differing sizes scattered along their upper bodies. The dorsal and caudal fins are also spotted. It is called a trout due to its shape and color which is similar to a brown trout. The average size is 1 to 2 lbs. with 5 lb. Gator Trout being rather common in Mosquito Lagoon. The Spotted Seatrout can grow to a length of 39 inches with a maximum weight of 17.5 lbs. Males reach sexual maturity around 2 years of age with females maturing a year later. The expected life span of the Spotted Seatrout is around 8 to 10 years. Adult Spotted Seatrout are found near seagrass beds in the summer months and are drawn to deeper water during the cooler months. They are known to swim in small schools with the incoming tides and generally move into shallow waters to feed. Speckled Seatrout are considered ambush predators. These fish pounce to grab their prey with their canine teeth. Their spawning season is triggered by temperature and salinity. Male Speckled Seatrout make a sound similar to drumming to attract their females just prior to sunset during warm summer months with spawning occurring during the night hours. 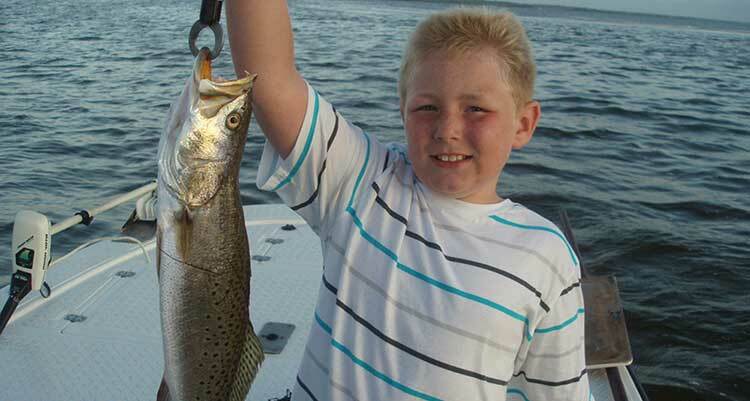 Speckled Seatrout are one of the fishes most targeted in Mosquito Lagoon. They are great fun to catch and delicious to eat. What a Great Trip! Capt. Karty put us on The Fish and we caught our limit on 'Gator' Trout. If you're looking for a very laid back fish catching trip, This is one to go on. Thanks Capt. Karty for a Fantastic Trip!!! We had a great time! Caught 8 really nice sized trout and really enjoyed being with Captain--what a nice guy! Spotted Seatrout are known to be most active around dawn and dusk and to be attracted to light. Live or dead shrimp and finger-sized mullets are commonly used baits. They will accept soft artificial baits if presented properly. Pigfish are like candy to Spotted Trout and are only available for use as bait in the summer months. 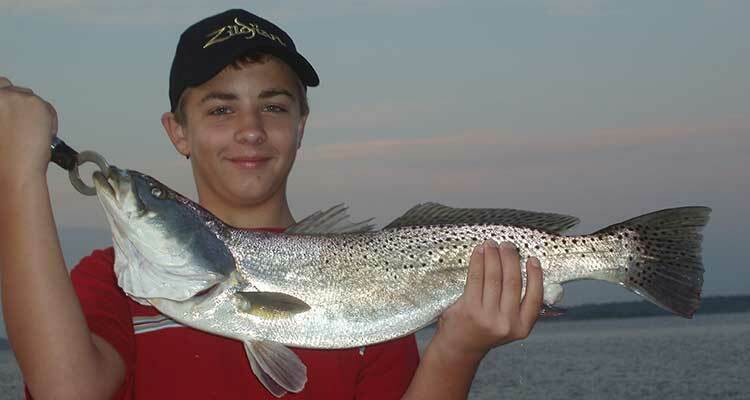 These live baits make a croaking sound that draw in the schools of Speckled Seatrout and are known to be very productive baits in Mosquito Lagoon. 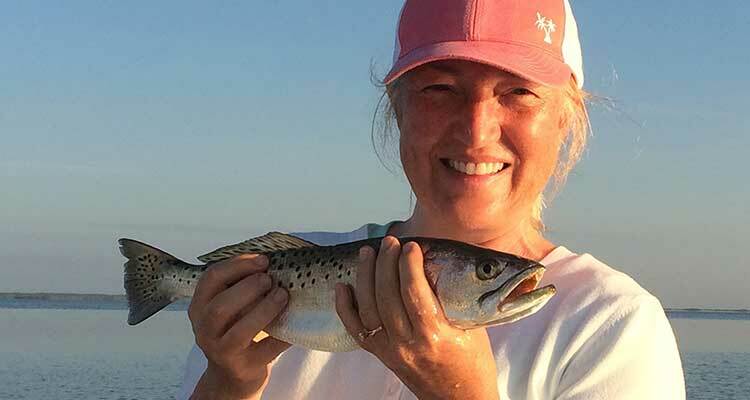 Anglers often use popping corks when fishing for Speckled Seatrout. The popping cork is sharply pulled periodically to create an attracting popping sound that simulates live action. 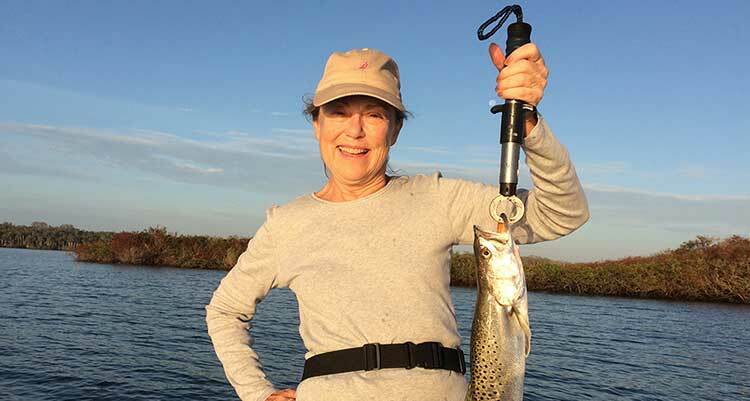 Varying the retrieve, the frequency of popping, and the depth of the bait help produce favorable results in catching trout in Mosquito Lagoon. The firm, white meat is considered quite tasty and is harvested by commercial and recreational anglers. Spotted Seatrout can also be coaxed into accepting flies. Fly fishing anglers often use small to mid-sized patterns replicating local baitfish. Flies patterned after crustaceans and shrimp are also productive in Mosquito Lagoon.